Cleaning your garage door not only makes your house look great, it also can help prolong your garage door’s life. After you clean the door, it’s a good idea to do a quick maintenance check to make sure that everything is working as it should. 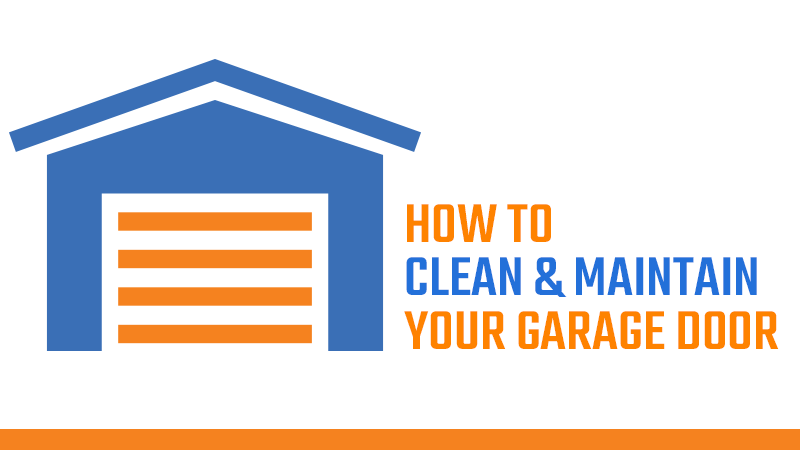 Take a look at this quick guide to cleaning and maintaining your garage door. To get started, fill up a bucket with a mix of warm water and dish soap or gentle detergent. Spray the door with a hose, then wipe the dirt and dust away with a rag or brush and the warm soapy water. Once the dirt is all washed away, rinse the door with the hose and let it dry. 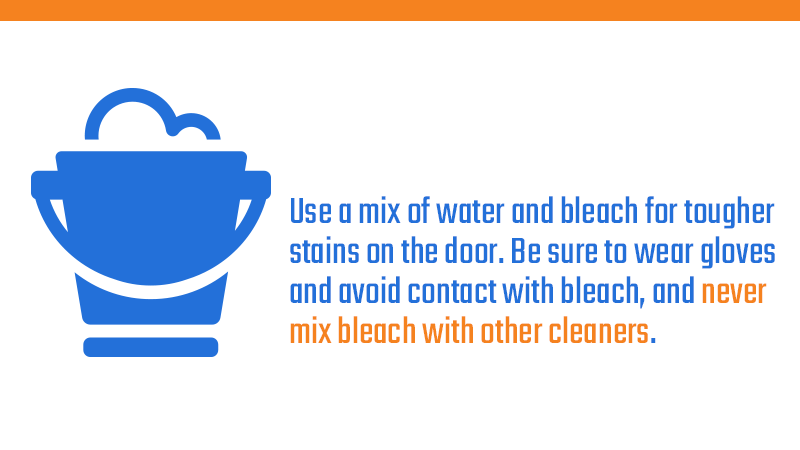 Use a mix of water and bleach for tougher stains on the door. Be sure to wear gloves, avoid contact with bleach, and never mix bleach with other cleaners. If you have a metal garage door, you can add a layer of wax after the door dries to add some luster to the metal. Make sure to clean both sides of the garage door. Although the inside isn’t visible to anyone but you, dirt build-ups can still cause maintenance problems and spread dirt and dust to your cars and other belongings. Once you’re through cleaning, it’s time to do a quick maintenance check. If you have a painted garage door, check over the door for any places where the paint is warped or worn away. Refinish any areas where the metal is showing through to avoid rust and corrosion. Dust the door’s tracks with a broom or a damp rag. Debris in the tracks can cause extra wear on the doors and can even cause the whole door to derail and become inoperable. Lubricate the tracks and wheels as well. Now is a good time to test out the door’s safety systems. Place a brick or a piece of wood under the door, and close the door. When the door hits the object, it should automatically reverse directions. To test the photoelectric safety feature, close the door and carefully place your leg in the door’s path. It should automatically reverse as soon as your leg comes into the door’s path. Finally, organize your garage to make sure that you don’t have any items sitting too close to the door that could fall into the door’s path. Items lodged in the door’s path can cause damage to the machinery. Need more garage door maintenance help or repairs? Contact the experts at ACS Overhead Doors for all of your garage door service needs. We offer 24-hour emergency service, should you ever need it. And don’t forget to take a look at our special offers.